LightWave 3D is a complete modeling, animation and rendering solution. Its native renderer is unparalleled and serves as the centerpiece in the production pipeline of many facilities both large and small. Render nodes are free and set up is quite straightforward. LightWave Modeler excels both as a subdivision surface and a polygonal modeler, fast, efficient and again, straightforward in functionality. In addition, an industry leading node-based texturing and shading system allows you to create any look you desire – quickly and easily. LightWave is the perfect combination of power, speed and value. 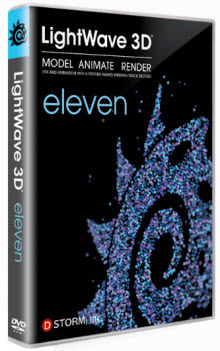 Long considered one of the easiest 3D animation systems to learn and use, LightWave 3D is versatile enough for any application from award-winning visual effects to stunning hi-res print graphics, dynamic video games, powerful motion graphics and more. LightWave offers modeling, animation, dynamics, volumetric rendering, particle effects and a motion picture quality rendering engine with unlimited render nodes making LightWave the centerpiece of the most cost effective 3D production pipelines in the world. LightWave introduces new interface paradigms, such as a Node Editor for materials and surfaces, volumetric lights, and displacements. Exciting new physically correct cameras have been added, allowing artists to recreate any real world camera lens, and have footage rendered in LightWave match real world photography (a must for compositing CGI and real footage together). These cameras can also be extended into the hyper-real, or even bizarre, as any mesh object can itself be made into a camera and record a scene. The possibilities are limitless. New techniques for displacement mapping, and support for ZBrush® displacements have been added. New shading models, such as Blinn, Oren- Nayar, and Ambient Occlusion now allow for a tremendous versatility for artists no longer bound by the original shading model in previous versions of LightWave. Of particular note are the new shaders for sub-surface scattering, anisotropic specular and refl ection shaders (which allow for hromatic aberration), easy to use and offering a spectacular visual impact. Artists and technicians have more power to access, with the inclusion of the popular Relativity 2 expression system in LightWave. This system uses easy “expression wizards” to create associations between almost any scene component or animation channel, and has been used for some incredibly complex effects that were a snap to set up. All these changes and more make LightWave the best solution for all 3D artwork needs. Whether you are modeling or animating, working in fi lm and broadcast or for print, dealing with organic or inorganic objects – LightWave 3D is the tool for the job. * FiberFX: Complete hair and fur solution for all platforms. * Collada, FBX and OBJ I/O support: Improved compatibility with other applications. * Enhanced IK and Animation Systems: Provides improved character animation controls. * IES Lighting: Accurately duplicate physical lights from manufacturers’ datasheets. * Radiosity Cache: Unique animated and static caching with size multipliers. * New anti-aliasing methods: Greater control for balancing quality with render speed. * New global illumination and radiosity: Easily create photorealistic scenes, sharacters and products while simulating the effect of real-world lighting in photography. * Implementation of state-of-the-art BSP/KD Tree Algorithm: Provides much faster and more efficient raytracing; bigger scenes render a lot faster. * Improved multi-threading with dynamic segmentation: Insures maximum use of available CPUs, optimizing render times. * Speed increases many times over previous versions of LightWave: More efficient render times for today’s increasingly ambitious high polygon-count scenes for production. * Adaptive subdivision of a mesh based upon distance from the camera and visibility: Allows for effective use of system resources for workflow viewing versus rendering. * APS Choice: Per Object, Per Polygon and Per Pixel: Provides the widest range of flexibility. * New rendering technology produces scenes using arbitrary camera lenses and warps: Create fantastic effects such as: camera plane deformations, arbitrary projections, UV map generation, true orthographic rendering, space warp simulations, lens distortion duplicating real-world lenses or “imaginary” lenses and one-camera 360° panorama rendering. * Improved editing performance: Create and edit your models and meshes faster than ever before. * New screen drawing system in OpenGL: See the results of your changes faster than ever before. * Catmull-Clark subdivision surfaces: Expand and simplify the modling workflow by widening subdivision capabilities to include edges, edge weighting and n-gons.